Triple Crown winning jockey Mike Smith will sign autographs November 17 at Los Alamitos Race Course to benefit the Sam Thompson Memorial Foundation. 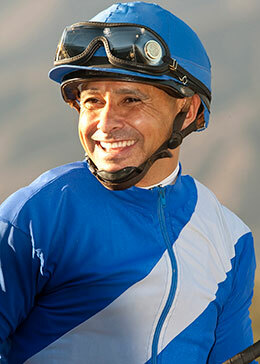 LOS ALAMITOS, CA—NOVEMBER 5, 2018—Triple Crown winning jockey Mike Smith will make a special appearance during the Bank of America Challenge Championships on Saturday night, November 17 at Los Alamitos Race Course. The Hall of Fame jockey will be at Los Alamitos signing autographs on commemorative posters that will be available for purchase on the night of the event. Proceeds from the Mike Smith autograph signing will go to the Sam Thompson Memorial Foundation. Mike Smith won this year's Kentucky Derby, Preakness Stakes and the Belmont Stakes while riding the unbeaten Justify to win the Triple Crown. Justify became only the 13th Triple Crown winner in American racing history. "We are so excited to have a world class athlete, celebrity and supporter of horse racing to join us for one of the biggest nights in quarter horse racing and to help us raise funds for the Foundation," said Laura Joiner of the Sam Thompson Memorial Foundation. Mike Smith is no stranger to Quarter Horse racing, as he rode Check Him Out in the 2002 El Primero Del Ano Derby at Los Alamitos. He is also the sport's leader in Breeders Cup wins and the second leading jockey of all time with earnings over $312 million. Among his many Breeders' Cup victories, Smith won the Breeders' Cup Classic with Arrogate in 2016 and with champion mare Zenyatta in 2009. He also piloted Thoroughbred champion Shared Belief to victory in the inaugural Los Alamitos Derby in 2014 and McKinzie to victory in the 2017 Grade 1 Los Alamitos CashCall Futurity. The autograph signing will take place on the main level of the grandstand at Los Alamitos Race Course from 8:00 p.m. to 9:00 p.m. (time is subject to change). In the past three years, the Sam Thompson Memorial Foundation has awarded over $100,000 in scholarship money to young people involved in the racing community. It has also given over $50,000 to those that have been injured on the backside or during races. The Bank Of America Challenge Championships Night will feature a full card of stakes races, a belt buckle giveaway presented by Montana Silversmiths, as well as a handicapping contest with berths on the line of the National Handicapping Championship in Last Vegas. For event schedule information, please contact Los Alamitos Race Course. For more information regarding the Sam Thompson Foundation please visit samthompsonfoundation.org.